Next month sees the results of the OECD’s Base Erosion and Profit-Shifting project, as well as a discussion at the UN tax committee on alternative dispute resolution in tax treaties. India has apparently vetoed the inclusion of mandatory binding arbitration by default in the OECD model tax treaty, and it remains an optional provision within the UN model too. This post will show that arbitration provisions in treaties with developing countries are nonetheless on the march, and it will discuss some of the issues that this raises. It is taken from some comments I submitted alongside Todd Tucker on a draft paper for the UN committee’s discussion. As a consequence, Korean investors have recently begun to invoke the mutual agreement procedure (MAP) in the Korea-Vietnam tax treaty. Vietnam’s first ever MAP negotiation was taking place while I was there. MAPs, remember, do not require the two countries to reach an agreement, just to try their best. The resulting backlog of disputes among OECD countries is the reason why the OECD now seems to favour mandatory binding arbitration. Vietnam does not want to see mandatory binding arbitration clauses in its tax treaties, having already had its fingers burnt with investor-state arbitration. I am informed that such a clause was proposed by the US and rejected by Vietnam when the two countries negotiated their new tax treaty. Vietnam said no, but others have not. 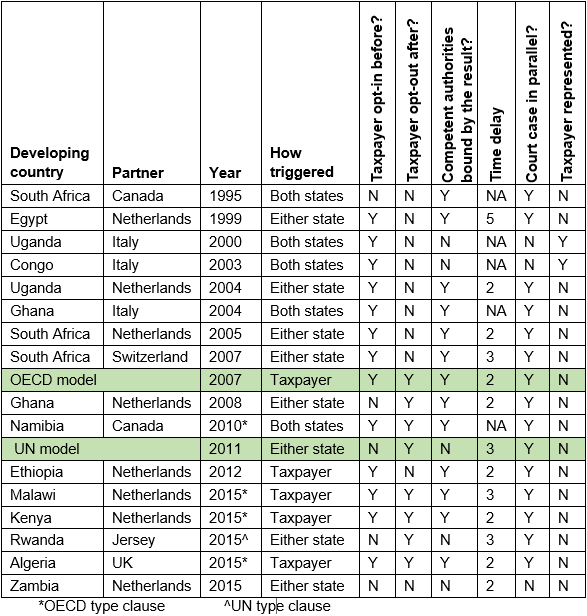 One outcome of the Netherlands’ programme of renegotiations with developing countries, which is supposed to be about adding anti-abuse clauses, has been the insertion of binding arbitration clauses in several treaties with African countries. Here are all the arbitration clauses in African tax treaties to date (based on searching the IBFD tax treaties database for the term ‘arbitration’). They key column to look at is “how triggered”. Whereas the Canadian and Italian arbitration clauses require both countries’ consent before the case enters arbitration, all the others, following the OECD and UN model provisions, are binding on the developing country and can be triggered by either the other country or the taxpayer. The rest of the typology indicates that, as per usual, OECD-type provisions are more common than UN-type ones, even though the latter are supposed to be better for the developing country. If we search for the term ‘arbitration’ in the IBFD tax treaties database, there are 219 results (caveat: not all of these references might be to ‘an arbitration clause’ as such, and some foreign-language treaties may have been missed). As the table below shows, arbitration clauses are of particular importance to jurisdictions whose treaty networks are used as part of tax planning strategies. 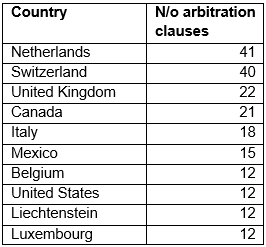 By far the most arbitration clauses are in the treaty networks of the Netherlands and Switzerland, although the presence of Liechtenstein and Luxembourg in the top 10 list may also be indicative. At least two of the Swiss clauses, in its treaties with Peru and Argentina, are actually Most-Favoured Nation clauses triggered if the Latin American countries agree to binding arbitration with a third country. This suggests that, for Switzerland at least, arbitration clauses are important for its competitive position. There is barely any MAP experience in many developing countries. Interviews with revenue authority staff across numerous developing countries indicate that, outside perhaps the BRICS, many countries have yet to enter into a single MAP. Vietnam is a typical example. So the case for arbitration based on the huge backlog in OECD and G-20 countries is simply not there in many other countries, and may never be. Furthermore, that developing countries do not have the same experience of MAP negotiations as developed countries is a further reason why they should wait before agreeing to mandatory binding arbitration. If arbitration is designed primarily to increase pressure for a resolution in MAP, then the pressure on a developing country to capitulate at this stage will surely be increased by its inexperience in arbitration as well as MAP. The current UN model provision does not provide for the possibility of optional arbitration. If arbitration helps solves a structural problem in tax treaties, it is good for developing countries to consider it. But one way for them to take it slow is to sign up for clauses that create the option of arbitration without forcing them into it, such as those in the Italian and Canadian treaties with African countries. With such a provision, developing countries could build up some experience before deciding whether mandatory and binding arbitration is right for them. Unfortunately, this is not the current path taken by the UN committee, and so there’s little chance of developing countries obtaining it in negotiations. Arbitration enhances the negative impact of negotiation oversights. We know that, as in the case of Vietnam’s early treaties, the present impact was often not anticipated at the time the agreements were signed. While this situation has improved in some developing countries, in others, treaties are still being concluded now without adequate awareness among all parties of how they will bind future governments. There are various reasons for this, including: lack of technical expertise at the time of negotiation; politically driven negotiations in which the content of these treaties is barely considered; changing tax systems and economic conditions, especially the growth of e-commerce and services; new tax planning mechanisms; the relative autonomy of a small set of negotiators; weak or non-existent parliamentary ratification processes. Binding arbitration will further enhance this ‘golden straightjacket’ impact of tax treaties, reducing room to manoeuvre in cases where latter day tax treaties frustrate present day policy goals. This would especially be the case if a multilateral instrument were used retrospectively to add arbitration provisions to existing tax treaties. A final thought. There are lots of reasons why eliminating all forms of double taxation faced by cross-border investors is a sensible thing to try to do. It is what tax treaties are supposed to be for. 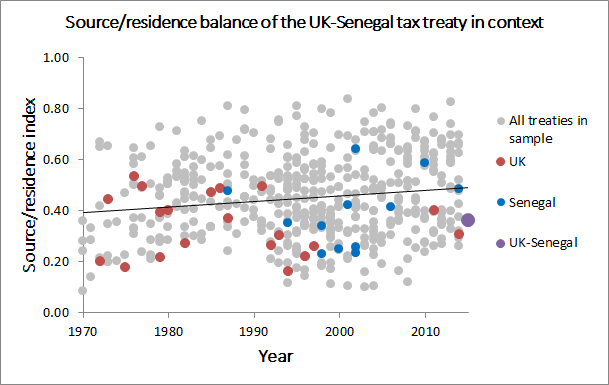 But sometimes governments, especially in developing countries, might deliberately choose to prioritise the maximisation of their tax base even when that leads to some double taxation. This is, arguably, what China, India and Brazil have done by adopting their own approaches to transfer pricing. Perhaps it is good if tax treaties leave sufficient space for this, so long as countries take seriously the repercussions of making use of that space. Is tax treaty arbitration really a bad thing for developing countries? I’m at the United Nations tax committee annual session this week, where I’ve learnt that I have to be careful what I write here, after a couple of posts from this blog were included in an input document [pdf]. Erk! I’ve been taking the opportunity to discuss with delegates the recent article [£] by the chief of the UN committee’s secretariat, Michael Lennard, on the inclusion of arbitration in tax treaties with developing countries. Lennard begins from the concern that I’ve raised here too, which is that the BEPS Action Plan implies the use of a multilateral treaty to introduce mandatory arbitration clauses into existing tax treaties. the cost of a full blown arbitration could be prohibitive for developing countries, forcing them to capitulate on some occasions, or alternatively stacking the process in favour of more wealthy countries who can afford the most skilled and experienced legal representatives. Because transfer pricing expertise is limited in developing countries, it’s likely that most arbitrators themselves will come from developed countries, in which case their neutrality – or at least their sensitivity to the realities of developing country tax administration – might be questioned. There is a range of concerns about the lack of transparency in arbitration outcomes, which is a problem for scrutiny (I’ve shared before a paper by Alison Christians on this topic), but could also mean that countries and lawyers only have their own experience to learn from, further biasing the arbitration process against developing countries to whom arbitration would be new. Lennard also talks about a range of ways that arbitration might work better for developing countries. I’m just going to focus on one aspect of this, which is the ‘simplified procedure’ that is used in the UN model’s optional clause. (It’s also known as ‘baseball arbitration’, because it’s used in pay negotiations in the US baseball league). Under the simplified procedure, the arbitrator doesn’t have to produce her own solution that tries to synthesise the concerns of the two sides. Instead she just chooses between one side’s position or the other. The costs are much lower, because there’s no need for lengthy meetings, the process demands much less time from the arbitrator, and – so one committee member said to me – you don’t need a lawyer to prepare written submissions. The arbitration tends to move countries’ positions closer together, because it’s an all or nothing outcome, and a more conservative position might be more likely to succeed. The democratic scrutiny point notwithstanding, transparency isn’t such a concern because the arbitrator is only permitted to choose one side, not to explain her reasoning – so there is very little to learn from past experience. These discussions have certainly changed my thinking a bit, but I’m not sure that it is as clear-cut as those who favour arbitration suggest. In a judgement-based process, as opposed to a purely rules-based one, the quality of submissions is sure to affect the outcome. And it’s inevitable that an imbalance between countries in resources, expertise and experience will translate into an imbalanced outcome. Isn’t it? Satellites in geostationary orbit: a new tax justice issue? When I made an amused reference to item on satellites in the new UN tax committee’s agenda, I wasn’t really sure what it was about. Richard Murphy thought it might be a plan to create tax havens in space. But, now that the UN secretariat have released some preliminary documents for the committee meeting next month, I think it may be a very good example of the differing interests of developed and developing countries in international tax. The OECD position is unanimous and, so it suggests, inevitable based on other aspects of international law. But consider this: most of the world’s commercial satellites are owned by companies resident in OECD countries. Many (perhaps all) developing countries have satellites permanently orbiting over them and broadcasting signals onto their territory, while down at ground level they have no companies making profits from this industry. Under the OECD position, there is no possibility of developing countries raising corporate income tax from this sector. There may be a philosophical discussion that is much broader than tax, as the OECD commentary suggests, about ‘how far the territory of a State extends into space’. But I imagine that the consequence of the point about the satellite’s ‘footprint’ is that a state has no right to treat a satellite as a taxable entity if it is, say, broadcasting commercial TV to its residents, or providing GPS positioning to people on its territory. If my assumptions are correct, that makes for quite an interesting discussion. A quick hunt around online suggests, for example, that the fixed position of a satellite in geostationary orbit means that it is not considered as movable property as far as US state tax is concerned – which might imply that it is a fixed place of business for international tax purposes. What would be the positions of the BRICS, some of which have their own burgeoning space sectors? Already, an OECD consultation document [pdf] implies that there were disagreements on this issue among its members. I would guess that smaller developing countries have not considered this matter at all. In any event, I will certainly look forward to the discussion in October!